If there were ever any doubts about Hillary Clinton’s health, they’ve all been removed — or at least that seemed to be the plan. 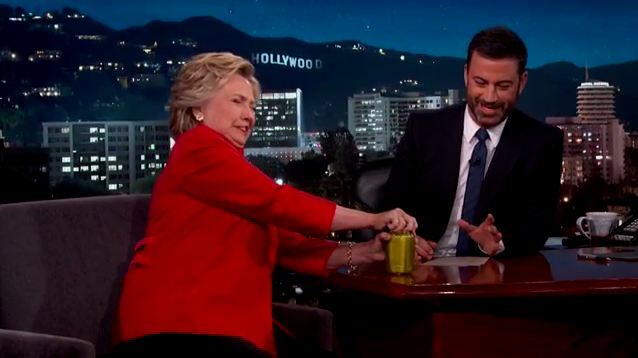 While appearing on “Jimmy Kimmel Live,” she opened a jar of pickles. Not just any jar, mind you, but one that appears to have been pre-opened. Good catch. I went through the video a few times to see if I could hear any pressure being released and I couldn’t. Viewers at YouTube weren’t impressed, either. “(W)ow! she can open a can of pickles (without having a seizure)! she is ready to be president NOW!!!!! !” one person said. Before opening the apparently pre-opened jar of pickles, Clinton dismissed talk of her failing health as though it’s just a wacky conspiracy being spread about by conservatives. Host Jimmy Kimmel opened up the discussion by asking Clinton, 68, about the rumors most recently raised by Rudy Giuliani, a close adviser to the 70-year-old Republican nominee; “Are you in good health?” he asked. She responded by cheekily getting Kimmel to take her pulse. It seems we’re all just supposed to ignore the bizarre seizures she’s had and we’re all just supposed to dismiss the numerous reports of her health issues. Apparently, as the saying goes, these aren’t the droids you’re looking for. After all, she can open a jar of pickles that someone else has apparently already opened… With “proof” like that, who needs doctors?